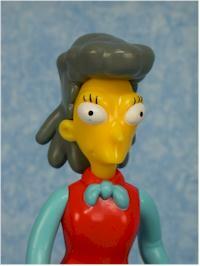 The latest series of Simpsons figures - series 13, can you believe it? - is now hitting shelves. 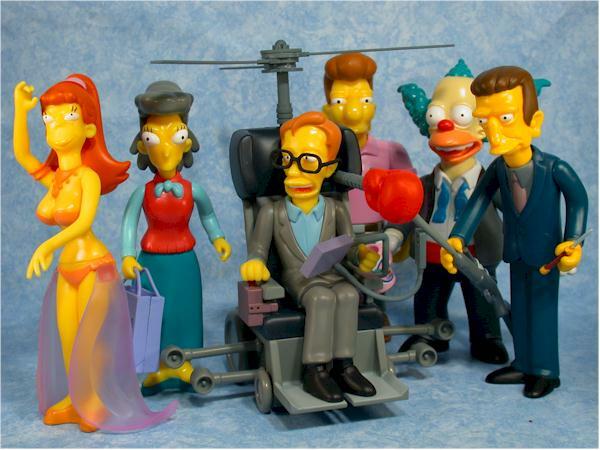 This set includes Freddy Quimby, Stephen Hawking, Princess Kashmir, Helen Lovejoy, Legs, and Tuxedo Krusty. No Bart's or Homer's, and TWO women! These are all certainly minor characters, but many of them have played key roles that are well known to all fans. I've found them only at Target so far, but with their price of $5.99, that's really where you want to find them anyway. I'm sure Toys R Us, Media Play, Meijers and others will also have them shortly. 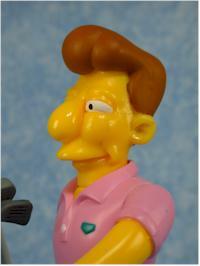 These figures also represent the final mail away figure in the Be Sharps set, Be Sharps Barney. Playmates was nice enough to bring a whole big bunch with them to the Simpsons Merchandise panel I moderated at San Diego, and give them away to attendees, so you'll see my review of that Barney very shortly as well. It's the new packaging, and already I'm running out of things to say about it. Looks good, still tends to warp over time, and the proof of purchase has moved to the bottom of the insert flap. Last series the sculpts varied from ** to **** stars, a pretty damn wide variance. This time things are a little more consistent, and there's no stand out stinker. There are two stand out winners though, in Princess Kashmir and Stephen Hawking. Quimby is easily my least favorite (overall) of this wave. Now, some people will really like him, because they really like his one episode, but I'm pretty lukewarm on him as a character goes. The sculpt is decent, but nothing to write home about. Helen Lovejoy is next up on the Dullsville Express, although she's a major improvement on her husband. He's my least favorite figure of the entire line, even worse than Database, so Helen is quite a step above that. She does look like the character, and the style and pose are acceptable. She's just a dull figure. 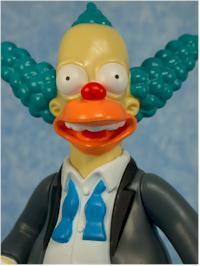 Krusty is one of those so-close sculpts. He's wearing his tux, with the collar open, and had he been given a haggard appearance, he would have been fantastic. Instead we get a slightly different happy face, and it doesn't quite fit in with the tuxedo outfit, or how he usually looked in the tux. It's not that the sculpt itself is bad, just that a much better selection could have been made. Legs may be one that hangs around on the pegs, simply because not enough people are into the gangsters. We already have Don Vittorio and Fat Tony, and next series we get Legs. How far off can Johnny Tightlips be? The sculpt on Legs is solid, and he's got a great expression on his face, avoiding the zombie look entirely. But the two big stand outs here are Princess Kashmir and Stephen Hawking. These two figures are going to end up in office cubicles all across America. They are sure to be the most popular of this series. The dear Princess is perfect, although I don't recall her being quite so, uh, large, on the show. I can certainly see how Homer got himself into some serious trouble with this young lady. The sculpting is excellent, and there's enough cleavage to make your Jenna Jameson figure jealous. Drooling Milhouse fan boys are going to love this figure. She did lose a little because of the lack of a belly button - didn't she have one on the show? Maybe not. More importantly, mine also has an issue with her ponytail, which isn't inserted all the way into the back of her head. Try as I might, I can't get it to go the last little way in, and you can see the peg pretty clearly. Hawking's sculpt, particularly on the figure itself, is excellent. They managed to do something very difficult - portray his disability without it looking too silly, too understated, or too overt. They walked the fine line between capturing the look of the character without making it either too obvious or too subtle. For that they get extra points. But why does he only get three stars? Because of two issues that I'm sticking in the sculpt area that really bug me. First, while I've had other people tell me they have no problem with the glasses, I can't keep them on either of the two I bought and opened. The glasses are made of a very soft plastic, and don't sit on the ears and nose very well. You can bend them to stay better for awhile, but they eventually return to their initial position, and tend to fall off his face much easier than any other eyesight impaired Simpsons figure so far. The other thing that REALLY bugs me is the hand pad/controller. It is set up to be held in his left hand, while his right hand sits on the joystick on the arm of the chair. The pad is upside down though, since when you place it in his hand the buttons face down (or out, depending on how you want to look at it). Since it's already formed with a loop going in that direction, and the peg holding it in place is designed to only go in one way, you're stuck using it upside down. No sloppy work here at all, and all the figures are an improvement over past some of the past waves. Again, the dear Princess is an excellent example of paint ops working perfectly. She has lots of small areas of pink, and it would have been very easy to slop that on to the yellow, and very obvious as well. But all the lines between her colors are clean, and I'm very impressed by the quality. Add to that the use of clear plastic for the veils, and you have a real winner. Lovejoy had some minor issues around her sweater vest and bow, and one eye was a tad off. Krusty was the only one with any real issues, and those were with the white, always a difficult color. Some of the color below the white is showing through on the shirt and gloves, and it's not as consistent across the figure as you'd like. Some folks are also not going to like his gray coat with the black pants, and I thought for sure he should be all in black. Gee, neck, waist, shoulders. No surprise there...but wait! Hawkins gets a little better score, and he's the guy in a wheelchair! It's that wheelchair that boosts his score, in an ironic sort of twist. 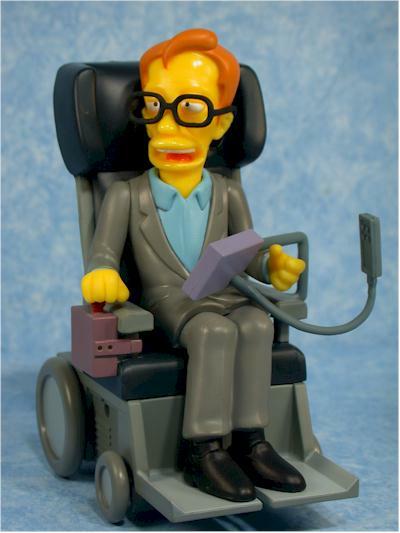 The Hawking figure is not a single sculpt with the chair, although he is permanently attached. I suppose if you worked hard enough though, you could detach him. It looks like if you did, he might actually turn at the waist like the others, but at least you know his neck and shoulders turn. But the wheel chair has further 'articulated' goodies. The wheels turn of course, and the propeller spins as well. Not only that, but each blade snaps (loosely) into a specific spot! It's a great touch, and really surprised me. 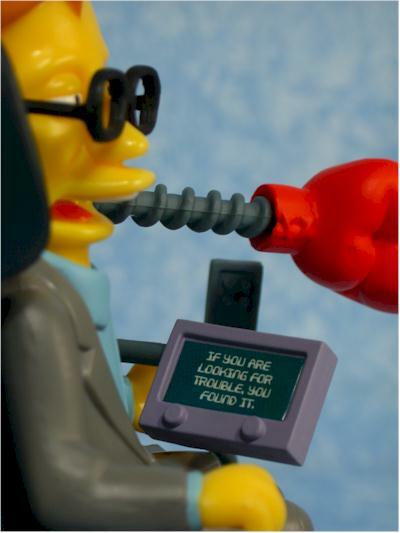 The control pad and screen also swing up and out of his way, so the chair is far more articulated than the average Simpsons figure. All the figures, even the boring ones, get great accessories again. And no reuse! 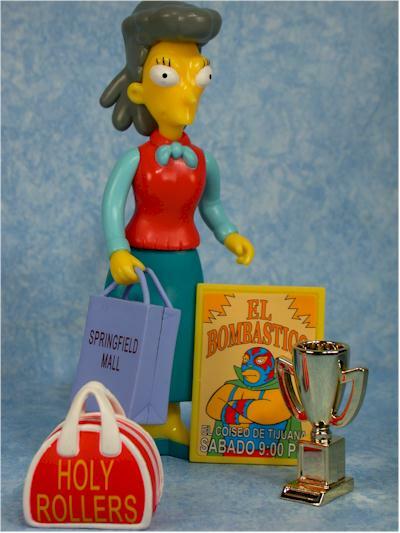 Helen has four accessories - a shopping bag, bowling bag (sporting the name 'holy rollers'), bowling trophy, and wrestling poster showing El Bombastico. I particularly like the bowling trophy, as it's been a commonly customized extra for the line. 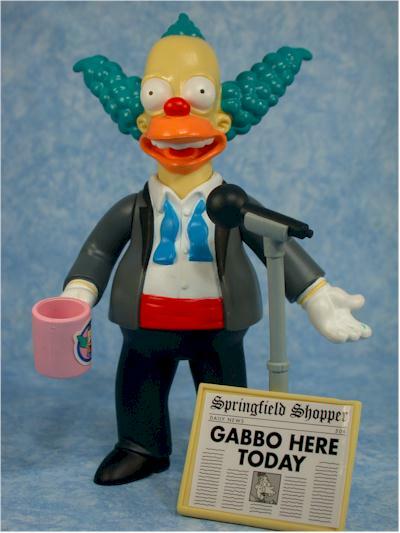 Krusty actually has the most accessories with five - the microphone, microphone stand, coffee cup, Gabbo headline paper, and a jewel encrusted clown nose that really fits on his nose! Kashmir has the fewest with three - the framed picture of her and Homer, the camera, and a boombox. The camera is a great addition as well. 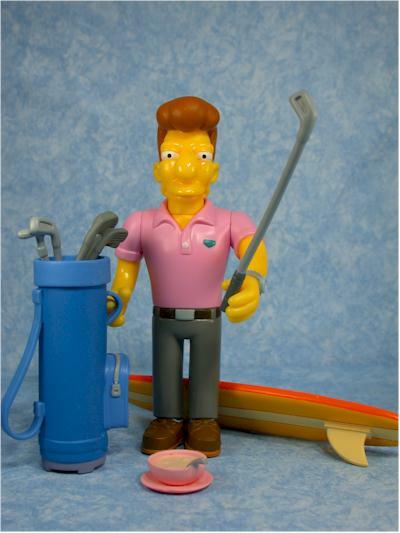 Quimby has his golf bag, one removable golf club, his surf board, and a bowl of chowder. 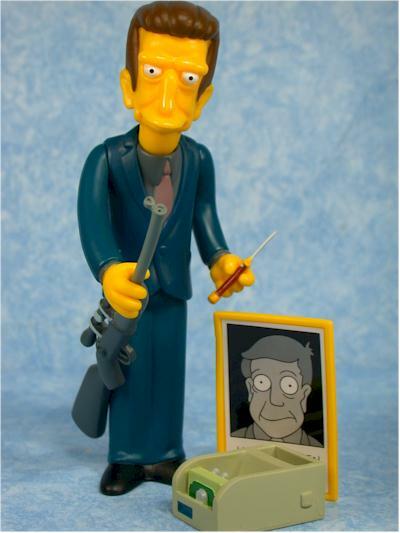 Legs has some great mob accessories, including a switchblade, rifle, photo of the missing Skinner, and a bill (money) counter. Finally, there's Hawking. Technically the only accessory is a beer mug (different from the previous ones), but since the rockets, propeller, and boxing glove are all removable from the chair, you might count those as well. More importantly, by making all those things removable, Playmates has allowed you to have the normal looking wheelchair if you'd prefer! That's another reason why this figure is such a stand out over the entire line. The figures are predominately compatible with the new sets, except for Krusty of course. That means most of the locations mean very little - why would Kashmir say anything at Herman's? Kashmir: "Oh, well, okay, but can we make it quick? ", "Well, um, my real name is Shauna Tifton" (I can barely make this line out on my set, and "Put your hands off!" Quimby: "I love each and every, uh, living thing on God's green earth"; "I'm not paying you to talk". Legs: "When he's done in there, I gotta go." Krusty: "I'm just a tired, old hack. "; "You kidding? I stunk up the joint! "; "Krusty's not for sale!" Hawking: "That's the smartest thing I heard all day. "; "If you're looking for trouble, you've found it." Lovejoy: I couldn't get mine to work on any of the pegs! That's a big negative for her of course. I gave her a couple points assuming this was a fluke for me. 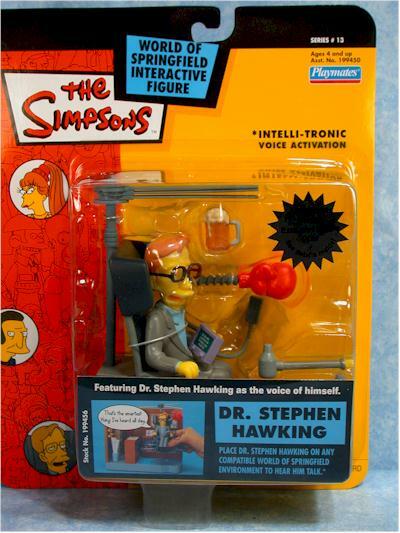 Of the figures, I like Hawking's the best, and his retractable connector in the back of the wheelchair is a brilliant design. Rather than have something like a cord hanging out in the way, you can easily display him without a playset and never notice it. He got extra points in this category just for that innovation. Overall, the line selections aren't bad but they are getting pretty light. With only one line for Legs in the shop, and probably not a whole lot in the Theater, the talking feature is getting less and less useful. Still six bucks at Target, and still a great deal. It's not the five bucks they used to be, but considering the quality of figures like Kashmir and Hawking, it's still pretty damn good. How many other figures for any line are under six bucks any more? Obviously, even with his flaws (damn glasses! 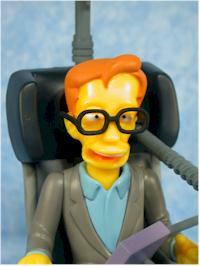 ), Hawking is the coolest figure in this set and one of the coolest figures in the entire series. 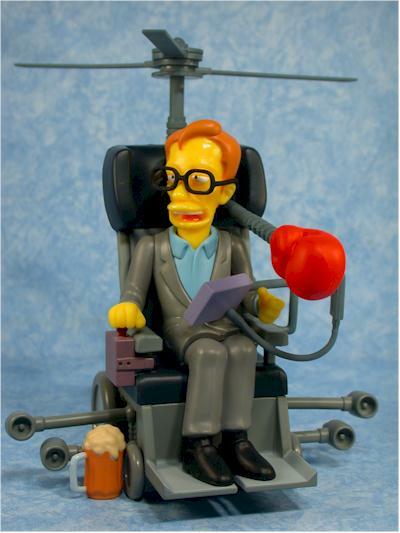 Hawking actually requested that they make this figure, and I'm very glad he did. 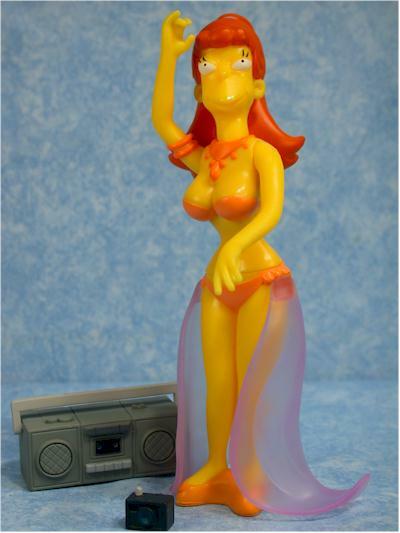 Kashmir is also one of my all time favorites now, and I wish I had a drunken Homer to go with her. I guess putting her on Main Street with McCallister will have to do. It's nice to have Legs to continue the gangsters set, and I can tolerate Helen, although putting her with her husband doesn't really work well since he's such a poor figure. But it's nice to complete sets like that, so I can't complain too much. 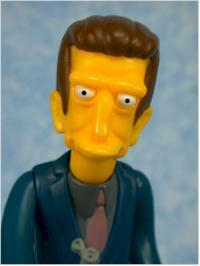 Quimby is the only boring figure in this series for me, and of course that's a personal preference. His sculpt, paint ops and accessories are all solid, so if he's a character you like, you'll be happy with the figure. - Ebgames.com has them individually for $6 each or $35 for the set. They are supposed to ship next week. - Entertainment Earth has the six for $40 plus shipping on their site.